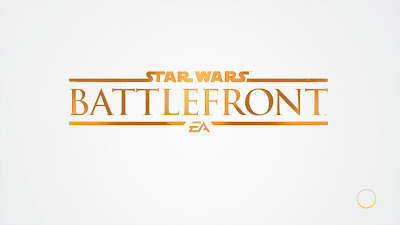 This is our first home console Battlefront for ten years, and just like the fact we're also getting a first proper Star Wars film for ten years, fans have been hyped and ready to get their hands on it at last. From the alpha and the beta, I'd already put in well over twenty hours, with the EA Access trial boosting that up another ten hours. With the full game now released, I still want to play more. Despite the modes being a mixed bag, the gameplay itself is fun. Despite a few minor niggles, the game itself is enjoyable. So let's get to it. The first thing you notice is how well detailed the planets are. Star Wars fans will instantly recognise Hoth, Tatooine, and Endor, and will instantly recognise Sullust within a few games. Each map is also diverse enough from the others in terms of visuals that it never feels like you see the same colour palette twice in a row. The larger maps of the planets are all different enough, from the rocky crags of Tatooine, the forest and walkways of Endor, the lava flows of Sullust, and the blend of inside comfort and outside harshness of Hoth. The smaller maps are mostly contained to indoor arenas, but even indoors you can tell the planets apart. Foliage will be right up to the windows on Endor, the whiteness of snow layers on Hoth, the Imperial militarism of Sullust, the sand blasted architecture of Tatooine. A few small maps are outdoor ones. Sulfur Fields, Jawa Refuge, Swamp Crash Site, and Dune Sea Exchange, with Ice Caves being equally outside and inside. All the maps have little details you can find, such as the Wampa door on Hoth or the Sarlacc pit on Tatooine. Aside from the visuals on a grand scale, there are also the visuals on a deeper level. Everything looks Star Wars. The rough and worn-in weapons and vehicles. The Aurebesh writing on surfaces and screens. Even the lasers themselves, and the impact off different materials looks Star Wars. Of course, the looks don't mean anything if it doesn't sound right. Thankfully the game does that right as well. TIE Fighters screaming through the air. Chaotic blaster fire from numerous places. The ee-unk of the AT-AT as it walks. The memorable score from the films. The comms instructions and soldier commands. It all feels right. The only place it doesn't is the heroes and villains, and the voices they have. They sound close to the original voices, but there is enough difference to them that it sounds off. The same can be said of DICE's original score that sometimes intersperses the film score. Of course, a game can look good and sound great, but unless it has great gameplay it isn't going to hold interest for long. Depending on how you feel a game should be, this will vary. The game has a more arcade feel to it in terms of gameplay. One main weapon, one charge card, and two star cards. There are also item pickups scattered across the maps. The weapons have set categories, so the stats between weapons of the same category don't vary too much. The charge cards are abilities of sorts, such as giving the weapon a damage increase or reducing its cooldown time. The star cards are where the grenades, secondary weapons, and jumpack are located, and you are allowed two of these. Once you unlock the second hand, you'll be able to have two star cards and charge card as your main hand, and a set in reserve that you can swap to on the respawn screen. The charge cards are powered by charges, and each individual charge card comes with 25 charges once bought. Extra charges can either be bought with credits earned, or found on the maps with one equipped. Once you reach level fifteen, the trait cards become available. These cards are separate from the hand, and stay active at all times. These cards act as perks. You will always stay at level 1, which gives a small boost in the chosen trait. Getting a killstreak will level up the trait, which increases the boosts active. Get killed yourself and you'll get knocked down to level one. All of this combines to give decent options for customising a loadout without overwhelming anyone. In terms of actually playing, it is fun. You'll be a soldier with your loadout, looking to attack or defend the objectives, searching out item pickups to give you an advantage, and hopefully get a vehicle, whether ground or air. Speeder bikes on Endor are actually on the map to get on to, and not within a pickup. And it's the speeder bikes which feel the most awkward to control. Rather than soldier and AT-ST's, where pushing forward makes you go forward, it instead applies throttle like in air vehicles. Yes, this allows you to control speed, but it doesn't need it when the analogue sticks can control such momentum anyway. Of course, PC players only have buttons, but so long as the speed wasn't set too high, it wouldn't matter so much. Other than that, everything else controls fine. But getting in an air vehicle will sometimes become annoying when you almost instantly get shot down. Just like with spawning. There are no visible spawn points for you to pick and choose from, so you just get randomly plonked on the map. If it so happens you spawn right in the middle of a heated battle, good luck surviving more than a few seconds. Battles happen fast and fluid, and the number of tactics available varies between modes. 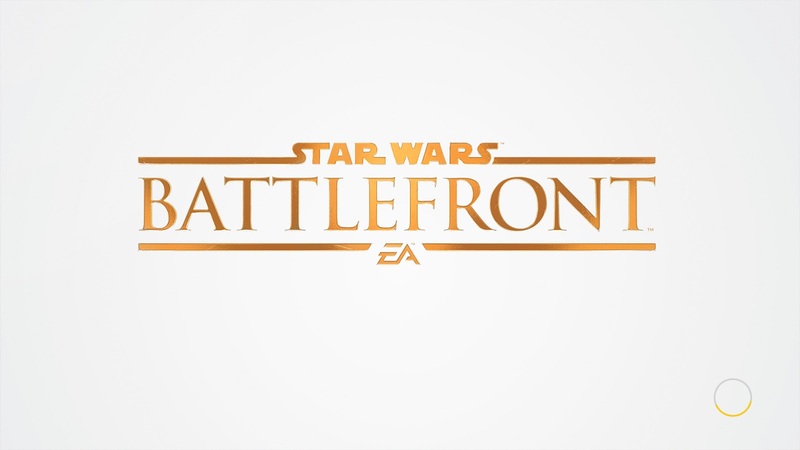 In all, there are nine, with a tenth coming with the free Battle of Jakku DLC [which itself will add two maps to the game]. The main mode that has been advertised constantly in this game's promotion is Walker Assault. In this mode, the Rebellion has the job of activating uplinks to call in Y-Wing bombers. 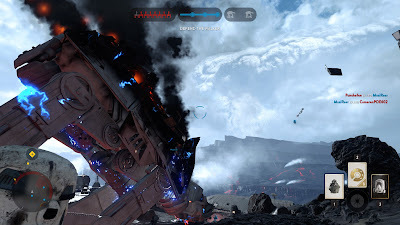 The longer these uplinks are held, the longer you'll be able to blast apart the AT-AT the Empire has the job of protecting through three assaults. The AT-AT can only be harmed during the Y-Wing bombing runs, so it is vital the rebels hold those uplinks as long as they can. I've spent most of my time in the full game here, and it certainly is a lot of fun. In one game, the rebel team was so strong we managed to beat out the Empire at the first bombing run. In another, it was the Empire's time to shine as the AT-AT were hardly damaged throughout the full three bombing runs. Supremacy has five control points on the map which both teams will be contesting over. As a control point is captured, time is added to the timer, so games can go on for quite a while if the tide is always turning. The more of the team in the control zone, the faster it will be captured, but the opposing team within the same control zone can cancel that out. Once the opposing force has been removed from the zone, the defenders need to reclaim the percent back to 100%. Again, this is a very fun mode, with the tide either constantly turning or headed in one direction from the off. It will always need the team to be focused on keeping the field clear to win. Fighter Squadron takes place fully in the air, with kills being the key here. Every so often, a transport for either side will take off, with the opposing side getting a kills boost if they manage to take it out. The Millennium Falcon and Slave 1 are available from the hero tokens, and while slower than normal ships, pack a punch in terms of weapons, and being hero vehicles means they also have a lot more health than regular vehicles. The fun here seems limited, as while it is fun to fly, the lack of a full flight control set [the ability to yaw being the obvious] means it gets slightly hectic trying to dodge missiles and there is no auto-level for when you somehow end up flying inverted. Droid Run has you claiming three droids, and trying to hold them for your team. Cargo is a capture-the-flag type mode, where attacking and defending these flags is the means to success. Drop Zone has two teams fighting to claim control of dropped escape pods, with the first to five winning. Blast is a normal team deathmatch mode, with the team who reaches a set number of kills winning. These four modes have been put together as these are the smaller modes, where the objectives are more focused on a singular thing. Being smaller modes also means enjoyment is limited even more than Fighter Squadron. If you enjoy competitive play, these are the modes for you. Then we get to the Hero modes. Heroes vs Villains pits the three heroes versus the three villains against each other in an effort to wipe the others out. You'll have the help of three regular solider teammates, and if you are killed as a hero, you'll be able to spawn as a soldier and continue the fight. Who gets to be the hero characters is randomly selected over the five rounds, which means that everyone should get to play as a hero at least once. Hero Hunt has one player as a hero with the rest trying to take them down. The person who takes the hero down - read: gets the takedown points - then becomes the hero of either Rebellion or Empire. Now these modes suffer from being focused on the heroes, but Hunt suffers more. Where in Heroes vs Villains there's an equal chance that either side can win, Hero Hunt makes it so the only winner is the person who can both claim and use the hero for longest, meaning there will be one to three standout players with everyone else left with nothing except a possible lucky break. Fortunately, the single player modes can help with that. 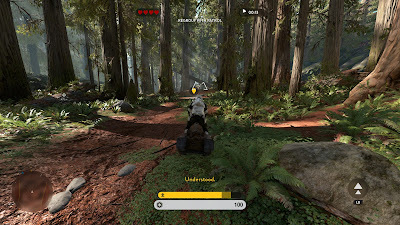 You've got the tutorial, with five set missions each dealing with mechanics of the game, whether that be speeder bikes, snowspeeders, or heroes. You'll only play them to gain the stars and possibly never look back at them. That's fine though, as these missions aren't meant to be the main attraction. Battles and Hero Battles pit two teams against each other in the quest for 100 points. In Hero Battles, the hero will let loose 20 points upon defeat, so be careful of that when attacking. You can compete against the enemy AI either alone or with AI backup. Survival pits you against fifteen waves of ever increasing enemy numbers [of strength, that is] with no backup at all except a few pods that will sometimes be dropped for you to claim with some item pickups inside. Both Battles and Survival can be played with a friend on local splitscreen [console versions only], friends online, or a random other. This can definitely even the odds up on harder difficulties, of which there are normal, hard, and master. Each difficulty nets you a star, with two bonus challenges per map. One of these is to collect the five hidden collectibles on the map within one game. The other is a task of making master difficulty a bit more challenging by not getting killed much, as the tasks include winning by not losing a life [Survival] or with the enemy team with less than a certain amount of points [Battles]. Collecting all the stars will take some time, but unless you find either mode replayable on the level of the multiplayer modes, there is little to hold your interest. Not to do the comparison so many seem to do, but the lack of an Instant Action - where all the multiplayer options were available to play solo - or a true single player experience means this is mostly a multiplayer game. That's not a bad thing, as more focus is put to the one area, but catering equally to both players could have been better. So was this the game fans have been waiting ten years for? Depends how you spin it, but this is a worthy reboot of what could be the most successful Star Wars video game series. Some won't like it for that however. Even now, despite the time sink I have put into this since release, there is something that makes me wish for an evolution of the formula that grew rather than a reboot of the original. Hopefully a sequel will grow this rebooted series as much as the original series grew from one to two. Is the game worthy of a purchase, though? This is first and foremost a multiplayer experience, so if you want a strong focus on solo play, this isn't for you. For everyone else, I seriously would recommend it. This is the first Star Wars game in a long time that really feels it has been crafted with a lot of love. There is enough here to keep you entertained, and with free updates confirmed, it should grow even without the season pass [access to the four DLC packs when they release, giving access to even more modes, maps, and heroes for roughly the price of the game itself]. Only thing I would say is that if you are unsure about a purchase, hold off for a sale.